Where does PowerPoint Shine? I use it when speaking to large audiences, educational marketing events, or going through the details of a project plan for a larger group. In the first case, slides can be used as long as you don’t lean on them. They provide a backdrop to you as a speaker. This is especially effective in educational marketing efforts because people want something in the way of an outline to follow. The problem comes when speakers start reading slides or putting more text on the slide than one might see in a memo. Try this. Use slides to show pictures. Using the background formatting features, change the background from white to a picture. Give each slide a unique picture that supports the message of that slide. For instance, yesterday in an educational marketing event I used a slide of my two-year old son in front of a computer. The slide was black, only his face was visible, with the light from the screen lighting up his face and keyboard. 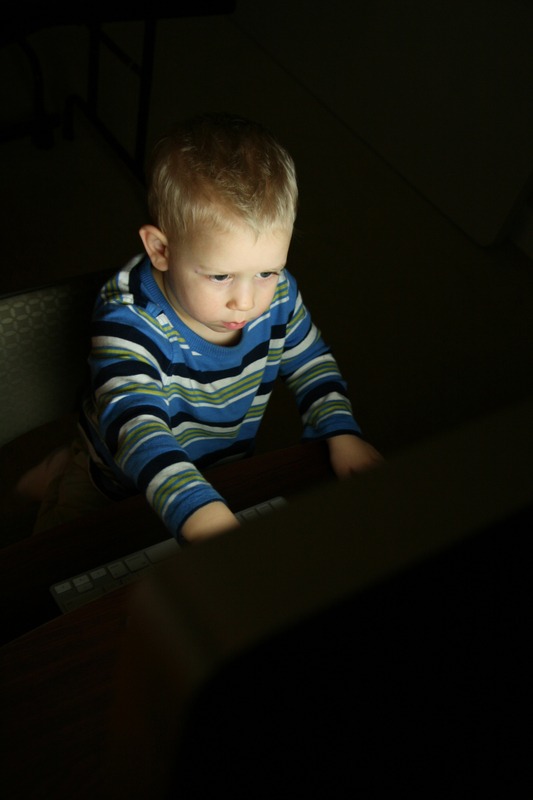 This dark, secretive looking computer picture with a child at the helm underscores how easy cybercrime has become. Three descriptive words to the left of the image serve to drive home my message. This type of slide is both memorable and fun to watch. The speaker doesn’t read the slide because it’s obvious. The audience is drawn into the speaker’s story with the image reinforcing the message. This is a good use of PowerPoint.